Start reading The Sky Above Us (Sunrise at Normandy Book #2) on your Kindle in under a minute. Sarah Sundin is the author of The Sea Before Us, as well as the Waves of Freedom, Wings of the Nightingale, and Wings of Glory series. Her novels have received starred reviews from Booklist and Library Journal. Her popular Through Waters Deep was a Carol Award finalist, and both Through Waters Deep and When Tides Turn were named on Booklist's "101 Best Romance Novels of the Last 10 Years." Sarah lives in Northern California, where she works on-call as a hospital pharmacist. Visit www.sarahsundin.com for more information. 5.0 out of 5 starsI really love the Paxton Brothers! These characters were just fantastic. Adler has much to prove and a lot to make up for after everything that has happened to him and been done by him. “Forget and Focus” seems to be his mantra as he strives to make ace and pave the way towards establishing his own shipping company. And Violet... sweet Violet. If you grew up the “good church kid,” I think you’ll relate to her quite a bit. With all her ideals of compassion and love for others, it proves difficult to actually live them in reality, and not just in her head. Especially when her growing admiration for Adler asks a whole lot more than simple sympathy from her. As with every book I’ve read of Sundin’s, The Sky Above Us is chalk full of rich history on the Red Cross and the Air Force, leading up to D-Day (there was even a brief nod to the MPs, which got me all excited because my great-Grandpa was an MP). I think you’ll be on the edge of your seat, hoping and dreaming alongside these characters. All in all, this is a fascinating story of forgiveness, humility, love, family, dreams and discovering our identity and purpose. I hope you enjoy it as much as I did. I received a free copy of this book from the publisher through netgalley in exchange for an honest review. All opinions expressed here are my own. I believe you can't go wrong with a Sarah Sundin novel. With every novel, Sundin invites me back in time to a world at war. She convinces readers to climb aboard the airplane or ship and fight for the American dream. 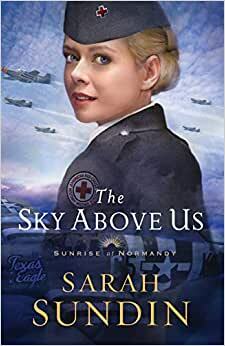 With her second installment in the Sunrise at Normandy series, The Sky Above Us, Sundin allowed me to fly above the clouds and take a ride with Alder as he tries to run from his past and his family. The hurt of the main character gripped my heart. The moments of transformation and repentance made me a little misty. The plot around D-Day in the air was a wonderful new take on the horrific day. The only gripe I have with this story, and it doesn't happen a lot for me when it comes to Sundin's books, is the romance. It appeared to be the main focus of the story. The D-Day invasion didn't appear to be such an issue until the day of. Violet and Alder had to work through their issues from the past and the future in order to grow together, but their romance was rushed and then it became too gushy for me. I was a little disappointed. I don't remember there being this much focus on the romance in her previous books. While I still enjoy Sundin's writings, The Sky Above Us just wasn't one of my favorite novels of hers. I still believe the amount of forgiveness and seeing another Paxton brother is worth it to pick up this novel and add to my collection. I received a complimentary copy of The Sky Above Us by Sarah Sundin from Revell Publishing, but the opinions stated are all my own. 5.0 out of 5 starsMy favorite WWII author hits a home run! I received this book yesterday. I finished it yesterday. It's rare for me to devour a book in one sitting, but it was unavoidable with this gem. I absolutely loved it, and I didn't want to put it down for anything. It was full of everything that I love in Sarah Sundin's books - clean romance, WWII drama, plenty of action, a mystery to solve, and fabulous characters. All in all, it definitely made for a 5-star book. I really loved how BOTH characters had to go on a journey of redemption, not just one or the other. It drives me crazy when one party is set up to be the perfect one, and the other has to elevate to that level. Not so here. Both Adler and Violet (I really love that name!) had to come to terms with parts of themselves that weren't up to their standards. They traveled the path together, with God, and on their own at times. It was very believable and something I could totally relate to. I really liked both of them and was cheering for them the whole time. I appreciate how much painstaking research Sarah does into the battles she writes. I'm a student of WWII myself, and I didn't see anything that gave me pause. She's very careful with her history, and I really like that. It makes the war come alive, and helps me immerse myself in the story. In my opinion, that's the hallmark of a fantastic writer!